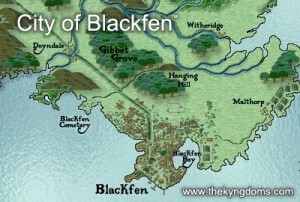 The Kyngdoms continues their exploration of the city of Blackfen with a look at the stinky underside of things with a look at the sewer system. The city of Blackfen is not blessed with an extensive sewer system and most of the waste of everyday city life ends up on the streets, attracting vermin and causing disease and illness, as well as a terrible stench. The sewer system that does exist is exclusive to Old Palisade Town and primarily serves the wealthy. The streets where the buildings are connected to the sewers are generally much cleaner and the air much less nauseating. Despite the relative small size of the sewers, this has not stopped the criminal gangs from moving in and using them for their own aims, using it to pass undetected around some parts of the city. They have also been busy roughly extending some parts of the sewers, creating rat runs under Blackfen that the authorities usually know nothing about and which are used to store contraband and as hideouts. Of course, the sewers have also become home to a number of other unwanted denizens, who find the grime and darkness much to their liking!